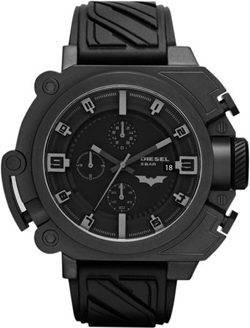 Company Introduces New Diesel watch Batman & Bane Dark Knight Rises. Agree, something quite a while nothing was heard from the company Diesel. Agree, something quite a while nothing was heard from the company Diesel. Recently the company introduced a new product year – watch Batman & Bane Dark Knight Rises, which, according to the company, will go on sale in November 2012. The company has specifically designed two new models, presented in limited editions, for the fans of the notorious movie: new Batman & Bane Dark Knight Rises devoted to the hero and the villain Bane Batman. The new hours are based in its technical and design execution on the watch collection SBA Diesel. By and large, original watch Batman & Bane Dark Knight Rises may be considered functional and at the same time fun accessory to the famous movie. The case of new products made from treated and painted steel, with hints, relevant Costume Batman and Bane. Diameter – 56.5h45.4 mm. The basis of hours – Quartz movement, with the additional function of indicating the date. Feature of the external design has also become a unique switch that activates the LED lights two, which provide an opportunity to see the time even in the dark. Lights hidden under the protruding ring with time indices. New watches are somewhat different from each other: Watch Batman Batman logo feature on the dial and watch Bane met with the inscription «Bane». In addition, it is possible to note a special engraving on the back of the Dark Knight Rises. Watch Bane is the difference between riveted brown leather strap, in the same style as the costume of the character in the film. Exact copies of new products, which, as mentioned above, will be limited, as yet unknown. Known price of hours – $ 325. 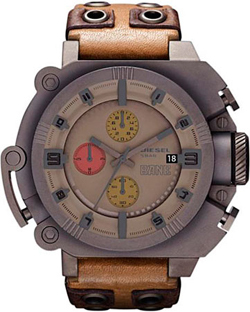 Buy watches will be in November 2012 with the official representatives of the company Diesel.